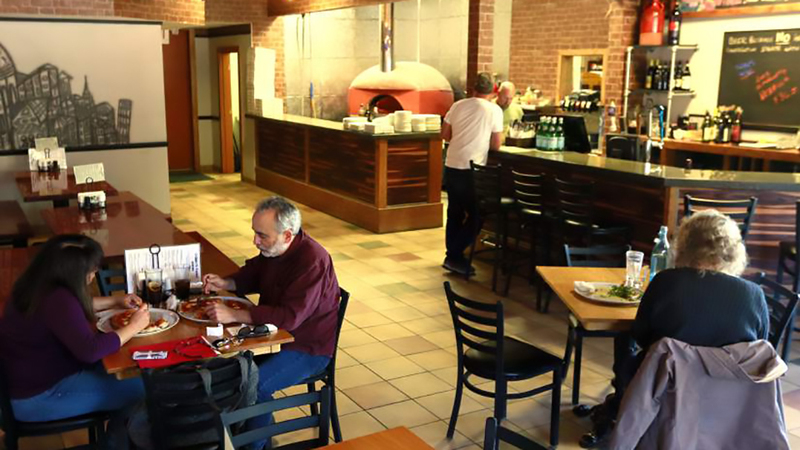 Pisano’s offers Artisan Pizza made the Italian way, by hand, in a wood fired Italian Pompeii oven fired with oak, apple, cherry and peach woods using fresh local ingredients. Located north of Bend in Tumalo, they offer a fusion of Italian flavors with some New World specials, including gluten-free and vegan pizza made fresh every day and weekly specials on their chalkboard. They say it’s Pisano’s mission to “pour our love of the craft into every pie we make. We use only fresh local ingredients, handmade sauce, dough and cheese.” They are open Tuesday-Sunday for lunch and dinner. People compliment its “small-town” feel with personal service from the owner. They also mention the Tuscan wings, the quality of the salads and the excellent wine list. Their award-winning Filet Mignon pizza features (duh) Filet Mignon, roasted Maui onion with a spicy wine reduction, Fresh roasted Garlic and Fresh Mozzarella and their Diavola serves up hot red pepper oil, spicy Ligurian pepperoni, fresh hot Italian sausage, Calabrian red Chili peppers, crushed San Marzano tomatoes and fresh mozzarella, a couple examples that give you a sense of what you can look forward to.